I enjoy reading bloggers with enthusiasms for childhood icons of children's literature. For some it is Oz or Alice but for me it was (and is) Peter Pan. I have vivid memories of my pre-k self "flying" around our living room, bouncing from one piece of furniture to the next. Gosh, my mom was tolerant! I know I saw Mary Martin fly across our TV screen and the idea of "flying" caught my imagination again. As an older child I was treated to a performance of the musical at a theater in Anaheim, Calif. It was across the street from Disneyland I think Jane Powell was Peter. When my kids were very young I tried to get tickets to a nearby high school's production of the musical Peter Pan but to my dismay discovered the tickets were sold out -- a high school show sold out! This school's theater program was very ambitious. They were "flying" the actors. I still keep up with all things Peter. I enjoyed the movies, Finding Neverland, Hook and the 1993 version of Peter Pan. I still have to read Peter and the Shadow Thieves and I have Peter Pan in Scarlet on my mp3 player. I listened to J.V. Hart's Capt. Hook and thought it was long but interesting. I was reminded of my ongoing enthusiasm as I embarked on a search for music for a young mezzo soprano. This is the time of year when singers begin a study of Broadway music. Ingenue songs are more frequently written for sopranos so finding songs for the lower range of the mezzo which also fit the musical maturity of a young singer is challenging. Sorry, I just can't see a 16 year old with the gravitas to carry off "I'm Still Here" from Follies. I am also a curmudgeon about current Broadway musical stylings and young voices. 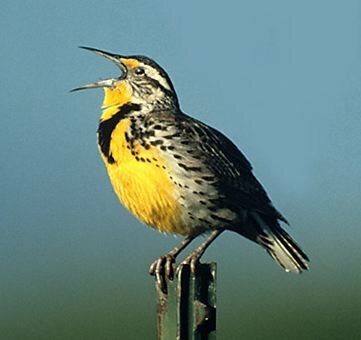 The current style of musical belting (either on American Idol or Broadway) does not showcase young voices IMHO nor does it bode well for the long term survival of the musical pipes. 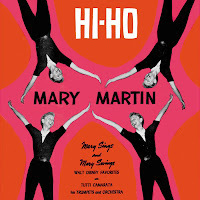 All this led me to rediscover Mary Martin. Peter Pan is still available (and in my car now) and I-tunes has her recording Hi-Ho available. Her Annie Get Your Gun is pure gold. As I pointed out to the young mezzo, every note is pure and every lyric is crystal clear. I heard Frederica von Stade refer to Martin as an "operatic" broadway singer on a local program recently. It is probably too much to hope I will hear "Never Never Land" at the recital at the end of the year, but I can hope. Great posting -- my family grew up on the Mary Martin Peter Pan, and my sister would run around the house singing "Captain Hook!" Recently I heard the "rediscovered" Leonard Bernstein music for Peter Pan. It's nice, but very classical, almost operatic. Last November, the NPR program To the Best of Our Knowledge had a great show on children's books called Lions, Witches and Wizards, where they interviewed Peter Pan in Scarlet author Geraldine McCaughrean (as well as Eoin Colfer and Matthew Skelton.) It's worth a listen. I will dial that program up. I love the NPR archives! I just finished my first McCaughrean book, Cyrano. 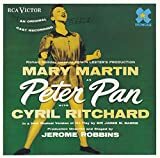 I have loved listening to my "new" recording (Mary Martin's Peter Pan.) The opening strains of the overture brought tears to my eyes, it was so lovely and familiar at the same time. McCaughrean's Peter Pan in Scarlet stirred up my own Peter Pan obsession. I was never too into the music, just the story. The kids have asked the librarian that if she ever plans to get rid of the video to set it aside for them. Have you ever heard This American Life's story about a Peter Pan production? Hysterical. No, I have not heard it. Where? when?